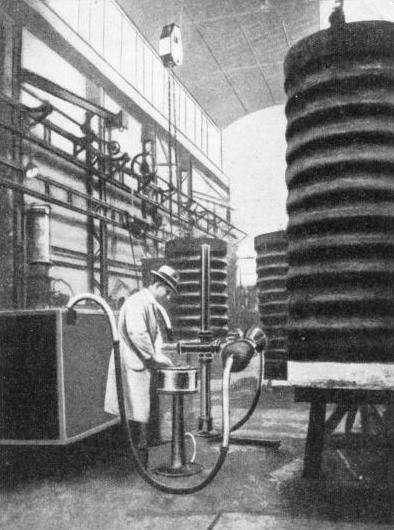 TESTING A WELDED BOILER DRUM in an engineering works with X-ray apparatus. The longitudinal seam of the welded drum is being examined under X-rays which will reveal any defect that might pass the most searching and thorough of ordinary tests and inspections. The apparatus shown above is mounted on a truck and can be moved from place to place without any risk of damage. WHEN a boiler drum, made from 1½-in steel plate, and having welded seams, is finished, visual inspection may indicate a perfect weld the full length of the seam. The inspector may order it to be checked with the radiograph, and the portable X-ray equipment is rapidly wheeled into position. Within a few minutes may come the report that the seemingly perfect weld incorporates a number of blowholes or that there is a lack of fusion. Such an occurrence is typical of the important service X-ray apparatus is rendering industry. It is not an overstatement to claim that its services in this direction may be as valuable in the saving of human lives as in the medical sphere. Had such a boiler been put into service - and all ordinary inspection would have shown it to be perfect - it would almost certainly have failed, thus risking the loss of men’s lives and a severe blow to the reputation of the boiler makers. An engineer designs a bridge, a boiler or a turbine, and bases his estimates on the maximum loading which the structure will be called upon to withstand. The proportions of all the sections and members are determined by allowing a considerable margin, known as the factor of safety. He has at this stage done all that a man can do. Yet any internal defect in the materials with which he is dealing can reduce all his calculations to absurdity. Lives are dependent upon the engineers being right and yet, after all due precautions have been taken, the structure may fail. This risk can nowadays be lessened in certain instances, though not in all, by examination of the internal structure of the materials. It is not to be assumed that the strength of materials has previously been taken completely on trust. Numerous specimens would be selected at random and tested to destruction, but the materials used in the structure might perversely include a fault. The X-ray has changed much of this. The engineer need not now design and hope. He designs and knows, that is, in those instances - at present relatively few - in which X-rays can be applied. No material at present known except lead is completely opaque to X-rays, and the penetrating power of the rays is dependent upon their wavelength. They are of the same family as radio waves and the visible light to which our eyes respond. X-rays are akin even to the relatively slow-moving power alternating currents. It is all a question of the speed with which the alternations occur, wavelength being linked up with frequency. Radio waves may measure as much as a mile from crest to crest, and visible light waves have a length varying from one five-thousandth to one eight-thousandth part of an inch. The crest-to-crest measurement of X-radiations is seldom more than one seven-hundred-and-fifty-millionth part of an inch, and the really penetrative rays are much smaller. The radiations of shortest wavelength are known as hard rays, and the less penetrative emanations are termed soft rays. With really hard rays, a good, sensitive photographic plate and a long exposure, photographs may be taken through steel up to 6-in thick. The existence of X-rays was discovered by Professor W. K. Rontgen in 1895. They are frequently termed Rontgen rays, therefore, and are known exclusively by that name in America as well as in most European countries. The discovery of these rays was preceded by experiments by Sir William Crookes, who performed valuable work in the field of electron optics. The electron had not at that time been recognized and for this reason the term “electron optics” is something of a misnomer; but the work that Crookes and later that Thompson carried out forms the basis of our present knowledge of the subject of X-rays. The method in these classic experiments was to apply a high potential to electrodes placed at the extremities of an evacuated glass tube. An invisible discharge takes place from negative to positive electrodes. 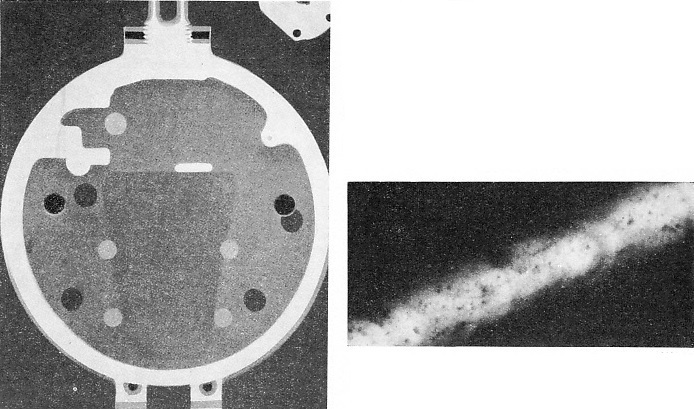 This discharge was shown to have mass, since it caused a lightly-balanced vane to rotate when placed in its path. The ray was also found to be capable of casting a shadow. 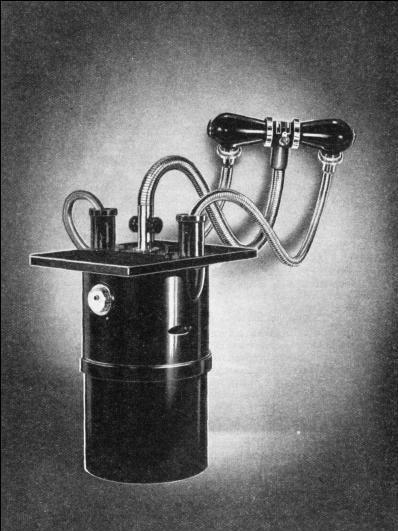 This emanation was known as the cathode ray, and has similar attributes to those of the cathode ray used in television transmission and reception. 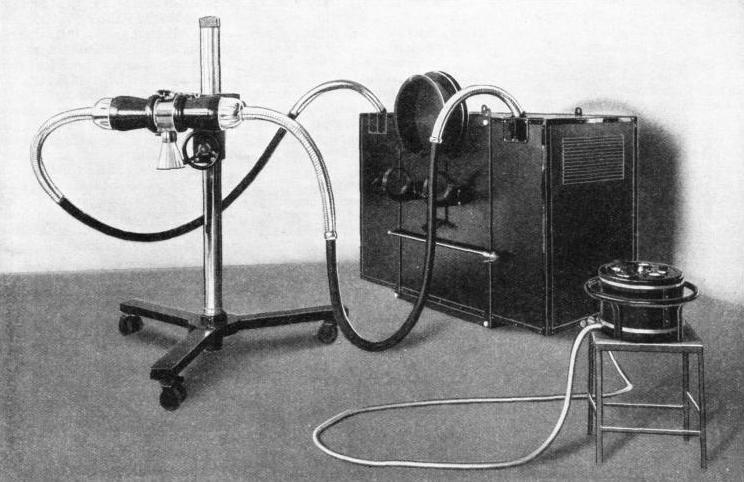 The cathode ray was shown by Professor Thompson to consist of a stream of electrons. If this electron stream is interrupted on its way to the anode, Rontgen rays are generated. It is now known that whenever an electron has its speed altered an electromagnetic wave is produced. Rontgen rays are electro-magnetic in nature, but of extremely short wavelength. The change of speed of the electron determines the frequency of the wave generated. If the change of speed is high, hard rays are produced. Slower speed changes produce soft rays. Nature provides her own X-rays in the form of radioactive substances, most prominent among which is radium. Every second in the life of a small quantity of radium, any number between ten and a hundred of the atoms disintegrate. The effect is akin to an explosion, and the particular atom affected changes its state. From the exploded radium atom, an atom of helium hurtles off with tremendous velocity. The portion of the original atom which remains behind will later suffer a succession of further explosions that will finally cause the radium atom to become lead. In this explosive manner, radium gives off three different types of radiation known as alpha, beta and gamma rays respectively. The first are made up of helium atoms, and are scarcely penetrative at all. The second type are regarded as being identical with cathode rays, that is, they are an electronic emission. The third type, or gamma rays, are exactly similar to Rontgen rays and are highly penetrative. This radioactivity is a remarkable phenomenon which is entirely outside the bounds of man’s control. In whatever temperature or medium radium may be stored, it will continue this disintegrating process in the same haphazard manner. Man cannot dictate in any way when the explosions shall take place. Although we cannot switch off the rays at will, they can be controlled by suitable screening. The radium bomb is widely used in medical work and to some extent in industry. The artificial method of producing X-rays has many advantages for industrial radiography. The rays can be generated as and when required, and may be controlled, within reasonable limits, to any degree of hardness. The making of X-ray tubes follows the lines of Crookes’s original research. X-RAY PHOTOGRAPHS, or radiographs as they are called, reveal the interior of engineering components as shown in the picture on the left. The radiograph on the right shows how a fault in an oxy-acetylene weld is revealed by the X-ray. An excess of acetylene has given rise to bubbles of gas and has caused a porous weld. Such faults are invisible except to the X-ray. To produce X-rays by artificial means there must be a source of electrons, which must be caused to travel at high speed to impinge on some target. Acceleration of the electrons is caused by giving the target a high potential. Modern industrial X-ray tubes operate at pressures which vary from about 200,000 volts to 400,000 volts. The source of electrons is a heated filament as used in the ordinary radio valve. The target is built up of heavy copper faced with tungsten. This metal is introduced because the kinetic energy of the electrons is dissipated on impact in the form of heat. So hot does the target become that a metal having a lower melting point than tungsten would probably melt despite the elaborate cooling systems that have been devised. Some designs allow for continuous circulation of water to keep the heat within reasonable limits. Others introduce cooling fins and yet others make use of black body radiation. The target face is arranged so that it presents an angle to the electron stream. Thus, when the stream hits the target, Rontgen rays are given off approximately at right angles. Pioneer workers did not realize the deadly nature of the rays. After continuous exposure, the pioneers developed dermatitis (skin inflammation) followed by cancerous growths. No substance except lead will completely prevent the passage of X-rays, but lead completely absorbs radiation. Modern tubes incorporate lead screening, and the tube itself is made of glass sealed in the centre to a metal chamber with an opening for the rays to emanate. Rontgen rays were first applied in industry during the war of 1914-18, when they performed useful service in the inspection of materials. Remarkably fine radiographs were obtained at this period in view of the relatively early stage of development which had then been reached. The introduction of radiographs as a testing medium helped to prevent a large amount of bad workmanship from evading the inspector. Cleverly concealed joins in aeroplane spars, vitally reducing the factor of safety, were unfailingly exposed by the radiograph. Post-war research has enabled vastly improved results to be obtained so that the X-ray outfit has become of such everyday usage that it is often used in the shoe shops for fitting purposes. Although we of the twentieth century have become surfeited with scientific wonders, the penetrative qualities of X-rays are remarkable even in an age of wonders. A thickness of 6-in of steel is so solid that to obtain a photograph through it is a feat which justifiably invites admiration. A point of interest is frequently raised by the query as to the possibility of photographing rays which are far beyond the range of visibility. An X-ray picture or radiograph is not a photograph in the accepted sense. It is a shadowgraph. The photographic plate is far more sensitive to light than the human eye and X-rays act upon the plate in the same way as ordinary light. Further, radiographs may be made immediately visible to the eye by the inter-position of a suitable screen. This screen is treated with a fluorescent salt which converts the invisible radiations into visible light. Direct viewing in this manner is possible only with relatively thin sections - up to about ⅝-in of steel. Thick substances must be photographed and a long exposure given. The logic of this procedure is easily appreciated if the thick section is regarded as reducing the available light. One curious feature of X-rays makes photography by ordinary means extremely difficult. The rays cannot be refracted. At least, no substance at present known is capable of refracting them. In the same way as ordinary visible light, Rontgen rays travel in straight lines, but they cannot be bent to focus at a point. Because of this, a photographic plate used for radiology must be as large as the object which is being radiographed. This fact presents serious disadvantages, as the cost of large plates is heavy and their size is inconvenient. INDUSTRIAL EQUIPMENT for the production of Rontgen rays, or X-rays, as they are generally known in engineering works. Modern industrial X-ray tubes of this type operate at a pressure of 200,000 volts. The rays are produced by bombarding a target of heavy copper, faced with tungsten, with a stream of electrons produced by heating a filament such as that used in an ordinary radio valve. Many research workers have given their attention to this problem, which is particularly acute in the medical sphere. In radiographing a human organ, changes which it is wished to record may occur several times a second. The clumsy process of changing plates occupies too much time. What is needed is a form of cineradiography, a process by which moving X-ray pictures could be taken. Such an achievement would be of enormous value in industry, for a succession of radiographs could be obtained of a machine or structure in working conditions. The first step towards the attainment of that ideal has already been taken, although the methods adopted are not yet applicable to industrial work. In brief, the idea is to take a cinephotograph of the image obtained on the direct-viewing fluorescent screen. Successful results have been obtained with this method in medical work. The human body does not absorb X-rays to any large extent. Direct viewing through metals, however, is possible only with relatively thin sections. Similarly, therefore, cineradiography is also limited to thin sections. The density of the material undergoing examination governs the thickness which can be radiographed. Aluminium and its alloys can be penetrated to twice the depth that is possible with steel. Wood sections up to five times the corresponding maximum in steel can be satisfactorily radiographed. Nearly every industry offers scope for the improvement of existing technique by the adoption of X-ray examination. A good weld shows on the X-ray picture as a uniformly white cloudy strip of constant density. Uneven fusion, porosity, gas bubbles or contraction cracks are clearly indicated as definite black markings. Not only does X-ray inspection prevent an inferior weld from being passed, but it also provides the welder with valuable data as to the success or failure of the methods he is using. Considerable economies can be effected by examining doubtful castings. An expensive casting might show a number of surface cracks. These may not be serious, but the manufacturer will not wish to proceed with the machining if the job is ultimately to be rejected. An X-ray examination will save the scrapping of a good casting and the waste of time on the machining of an inferior one. Motor-car and aero-engine pistons and cylinders can be examined simply with X-ray equipment. A piston breakage can be responsible for a great amount of damage and in aviation engine failure is particularly serious, as it may involve loss of life. The value of the radiograph in these industries does not end with the detection of flaws in materials and components. The aim of the designer is ever to increase the power-weight ratio of the engine. The radiograph provides him with valuable information for various researches of this nature. The development of truly portable equipment has vastly increased the field of use for X-rays. Tubes are available measuring little more than 1½ feet in length and the associated equipment is sufficiently light to be easily taken to the job. There is also a unit which incorporates tube and transformer in one housing which measures only 11-in by 6½-in. In this way an aeroplane, a high-pressure apparatus or a ship’s hull can be examined on the spot without dismantling or destroying any component. Small outfits of this type have not the capacity of their larger brethren. They are, however, capable of dealing with steel plates up to ¾-in thick or with 3 to 4-in of aluminium. A surprisingly large amount of work is embraced within this range. 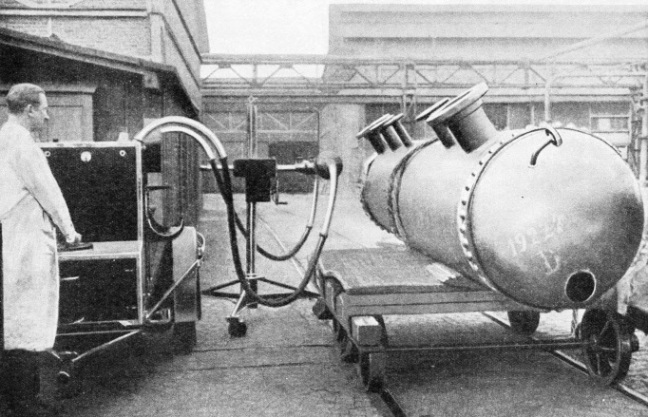 It is not uncommon to meet with these portable tubes in the dockyard, where their flexibility enables them to be operated in most difficult conditions. SPECIAL EQUIPMENT FOR CRYSTAL ANALYSIS by X-rays. Most materials are crystalline in structure and yield a characteristic pattern when subjected to a test by the X-ray diffraction method. Apparently identical chemical compositions can be distinguished by this means. Checking a heavy electric cable is no easy task by ordinary means. Radiographs are used by many manufacturers to check such items as the position of the conductor and insulation, the presence of air pockets and the introduction of any foreign matter in the insulation material which would reduce its dielectric (non-conductive) properties. The electrical industry offers many similar opportunities for the successful application of X-rays. Another interesting job which the radiograph is called upon to tackle is the examination of oil paintings. A radiograph of a genuine old painting shows a different result from that of a modern fake. The oils used by the old masters were mineral in origin, and are relatively opaque to X-rays, whereas modern pigments, evolved from coal tar. are transparent. By providing an infallible means of examining the internal structure of the raw materials and finished products of industry, X-ray equipment must be acknowledged as performing an incomparable service. The radiograph can, however, be used at an even earlier stage to assist the metallurgist. The structure of most substances is crystalline and, when subjected to tests by the X-ray diffraction method, yields a characteristic pattern which is peculiar to that substance. The demand for higher speeds and the necessity for lightness of construction without the sacrifice of strength have led to the development of innumerable light alloys for engineering work. Efforts have been made to obtain given characteristics in certain alloys by variations in the processing methods and composition. These and various other factors necessitate a testing method which will facilitate control of the alloy composition through varying stages of manufacture. In conjunction with the microscope, the X-ray provides such a means. The changes which occur in the structure of the material due to heat-treatment, ageing, chemical combinations or surface tensions can be accurately determined. In certain applications of the radiograph - particularly in medical work - it is desirable to add a sense of depth to the normally flat picture obtained. In other words, it is wished to obtain a picture which exactly represents what the human eyes would see if they were capable of penetrating the subject. This can be achieved by stereoscopic methods. Two X-ray pictures are taken simultaneously from slightly different angles, the difference between the two corresponding to the angles of vision of the right and left eyes. When viewed together through an appropriate stereoscope, the two separate pictures merge into one and show the subject in three dimensions. It is a tribute to modern production technique that such a sensitive device as the X-ray tube can be built on sufficiently robust and foolproof lines to take its place as almost an everyday workshop tool. Despite the enormous voltages used, the tubes are completely shock-proof. Heavy insulation surrounds the high-tension conductors, the whole then being contained in flexible metal tubes which are connected to earth. A twofold safeguard is afforded in this way. Should the insulation break down - an unlikely event - the current will pass harmlessly to earth. The calculation of the wavelength and the penetrative qualities of X-rays generated under given conditions is complicated. Despite this, the industrial equipment has been developed to a stage when it can be efficiently operated by the shop foreman. The penetration increases with the voltage, so arrangements are made for the potential to be easily varied to suit the conditions of working. There can be no doubt that, in the future, X-ray examination of materials and finished products will assume an even greater importance in industry. Already it is widely realized that inspection by radiograph is not a luxury but an economy, and in many spheres its use should be compulsory. Lloyd's specify X-ray examination of Class A welded vessels and insist that radiographs must be submitted to an independent inspector before they accept the insurance risk. EXAMINATION OF WELDED CORRUGATED FURNACES can be carried out in engineering works by the use of X-ray apparatus. This machine is of the stationary or non-portable type and is regularly used to inspect welds before the furnaces are built into the boilers. Specification of radiographs as the only satisfactory test in appropriate official Codes or Standards must raise the general level of engineering practice.